Day two at Summit began with an appeal that may sound surprising, even strange, to some: embrace chaos and drop the notion that success only stems from years of planning and organizing. The world of open source is one of the best proponents of this line of thinking, touting the principles of release early and often, fail fast, and a plea to try, learn, and modify systems. As Jim Whitehurst, president and CEO of Red Hat stated during this morning’s general session, "we always wanted to assume that there was more order in the world than there really is," in reference to successful tech organizations. Things are moving quickly these days. The new focus is on the emerging, not the planned. The Artificial Intelligence (AI) community is a great example, with thousands of practitioners making tiny incremental changes to the industry and the body of knowledge over time. Enterprises seeking to modernize their business can learn from this model. By adopting new technologies, like containers, and making the move to public cloud, teams can take an innovative approach to software development. They can now adopt DevOps delivery models, like continuous integration and continuous deployment, and begin writing scalable, manageable, microservices code. Wednesday’s breakout sessions focused on Red Hat® Cloud Infrastructure, Red Hat Cloud Suite, Red Hat Insights, Ansible by Red Hat and Ansible Tower by Red Hat, and Red Hat OpenStack® Container Platform; and how they can help optimize, customize, and automate infrastructure to transform IT. The phrase "digital transformation" is everywhere in the tech world. It’s what all businesses—no matter their size or industry—are trying to do if they want to stay competitive in the market today. Eric D. Schabell, global technology evangelist at Red Hat, walked through the foundations of digital transformation as it relates to enterprises. Slow delivery can become accelerated service delivery with a service designer who can catalog items and automate processes. A datacenter with one cluster runs hot, which is expensive. A cheaper place to host is a private cloud, but it’s not ready for workloads that need to be certified in platforms. With a management platform in place, automated triggers are added and the team can do their job better, resulting in IT optimization. Teams that work very separately from each other still exist. Monolithic apps are being replaced. As the apps replacing them move into the development phase operations doesn’t know what’s going on or what the state of deployment is. With modernized container development, the development team owns apps that run through development and production pipelines (continuous integration and continuous delivery), and the pipelines are managed and monitored by operations. Costs keep rising, so teams are moving to scale out infrastructure, but it’s difficult when teams are attempting the process alone. It is a complex and incomplete effort to self-monitor processes, workflow, and auditing. By delivering a scalable infrastructure, a single management interface can align with multiple locations and datacenters and create a scalable infrastructure with an enterprise grade scale-out. Red Hat Cloud Infrastructure helps you move from optimizing your legacy environments to a programmable infrastructure. It also gives you the ability to put together your own private cloud. Containers are a supporting technology, and can bounce things across the hybrid cloud. Enterprises can use management tools on top, and use Red Hat Satellite to provision. 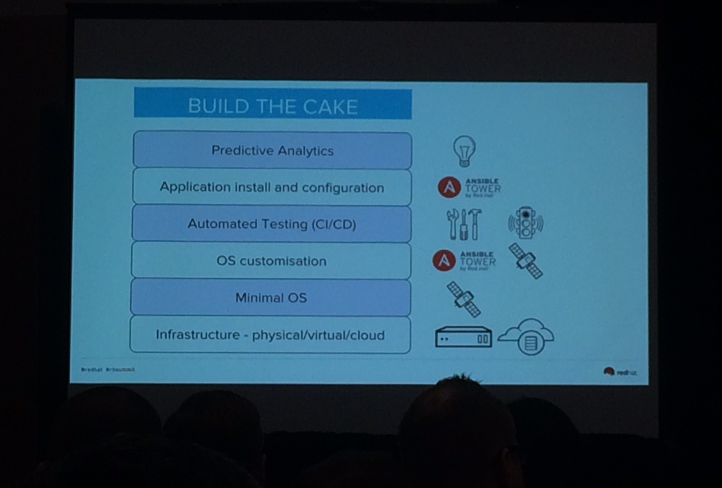 Lucy Kerner, principal technical product marketing manager on the Security team at Red Hat, found inspiration for her infrastructure security lightning talk, Secure foundations: Why Red Hat Enterprise Linux® isn't just another Linux distribution, at conferences. Specifically, conversations with people who, when they learned Lucy worked at Red Hat, would say, "Red Hat is cool, but I don’t need Red Hat Enterprise Linux." These types of conversations encouraged Kerner to counter those responses. There are the big operating systems (Windows, Linux), but there are tons of smaller ones out there, with more coming out every year. Unlike many others, Red Hat is not new at this. The company has been working on Red Hat Enterprise Linux for 15 years now, and we contribute our work upstream. Red Hat takes stable technologies in Linux, pushes them upstream, and makes them ready for enterprises. It’s the foundation where many businesses build their software platforms. An established enterprise would not want to work with a startup Linux operating system. Red Hat Enterprise Linux offers multiple security baselines right out of the box, including crypto API, SELinux, IDM/SSSD, OpenSCAP, and auditd. Additionally, customers have access to support, product security features, expertise, and the Customer Portal—tools that allow teams to focus on innovation, not maintenance. William Nix, principal product marketing manager on the Management team at Red Hat, then tackled his talk, Secure foundations: Infrastructure risk management, by sharing that, in this age of modernized application development, complexity is risk. As tools and needs evolve, a strategy has to be built to ensure existing investments and infrastructure aren’t endangered. According to a study conducted by Carnegie Mellon University’s Parallel Data Laboratory, 80 percent of commercial app outages are caused by software failure. Gartner shared that $336k/hr. is the median cost/hr. when there’s downtime in the production of an application for a larger enterprise. And $15 million/year is the mean annualized cost of cybercrime remediation for U.S.-based corporations (via the Ponemon Institute’s 2015 Cost of Cybercrime study). Considering these statistics, it’s more important than ever for enterprises to create risk management strategies before implementing infrastructure updates and to establish modern application development strategies. Enterprises can analyze infrastructure risk by reviewing actual or planned responses to outages, downtime, or cybercrime: Would your enterprise feel confident in the face of these interruptions? They can also think through the tools at their disposal and how those tools might help when work, data, or infrastructure are compromised. Also, before any upgrade decisions are made, enterprises must ensure systems are compliant with regulations and international security standards. Red Hat solutions can help with all of these risk management concerns. Ansible automates infrastructure; Red Hat Satellite gives access to patch and errata data; Red Hat CloudForms helps teams become agile and adopt DevOps principles; and Red Hat Insights manages at-scale risk, predicting and preventing problems through ongoing infrastructure analysis. The last lightning talker was Phil Griffiths, senior solutions architect at Red Hat, who addressed Making day-to-day operations more proactive, and less reactive. Why? Because more issues are affecting enterprises than ever before, and their needs for security and compliance are also increasing. Griffiths laid out a three-pronged approach to planning for these issues and meeting enterprise needs, SOS: Support, Operations, and Security. The "sprinkles," or extra layers of support Griffiths recommends, is Red Hat Insights, which finds two things for customers. First, it can solve critical issues on an application server. Second, the more systems you throw in it, the better output you get. When 90 percent of your systems are affected by one issue, you can fix that issue, automate the solution, and confidently move forward with other more strategic tasks. For the operations piece, in their current state, many enterprises do things manually or semi-manually with DIY scripts. Automation is the key to streamlining which ends repetitive tasks and frees up DevOps teams for more important work. For these needs, Ansible and Ansible Tower by Red Hat are a smart choice. You no longer have to write code, you write playbooks that Ansible then automates. In terms of security, much of the issues that Griffiths sees are port scanning and one-way traffic security teams that only fix critical red issues. His solution for these issues is implementing security policy at day one build time, then adding in operations compliance on day two. Enterprises should use profiling and tooling, get a compliance check tool, and build out business processes to ensure their security needs are met from the beginning, not when things go wrong. Over the past six years, OpenStack has evolved rapidly into a powerful choice for private cloud infrastructure. Customers are pushing OpenStack into production and starting to experience the benefits it provides. Al Sadowski, vice president of Infrastructure at 451 Research moderated a panel of OpenStack customers to share their latest use case trends and hear how customers are reaping the benefits of OpenStack. Yoan Bailliard is the NFV cloud manager at Orange, a European telecommunications leader. Bailliard chose OpenStack first because it was free, and second because his team already had Red Hat Virtualization in place. His team’s impetus was more related to networks functions virtualization as that is a real innovation for telecommunications providers. OpenStack also provides security services for firewalling. With their service based on OpenStack, Orange can create and deploy the service in minutes, reducing their SLA from weeks to almost immediately. Also, Orange used to have a fixed capacity, but now with OpenStack they have the agility to choose scale depending upon the requirements of service. For customers, service was often disparate before, but now they can see all networked services. For the Elisa Corporation, another telecommunications company based in Finland, the need to resolve issues led to the switch to OpenStack. Tommi Berg, head of Service Operations at Elisa said that they knew their development process had to be better. The company was at the point where IT had to create tickets for development, and for all the other changes that needed to take place. For Elisa, the main benefit of adopting OpenStack was agility: The team can now set up their infrastructure in minutes, not weeks, saving time and money, freeing up the teams for larger priorities. East Carolina University (ECU) came to OpenStack to address their customer needs, like additional CPUs, RAM, storage and VMs. The university was using old proprietary vendors and software. ECU needed to be more open and agile to meet customer demands. The university looked at other alternatives, but decided on Red Hat OpenStack and the team at Red Hat provisioned it for them in a few days. Now ECU can quickly meet customer demands and OpenStack is allowing them to automate a lot of how the university does business. Their IT team can provision VMs in minutes, instead of a week. While these results are a big deal, maybe the most impressive aspect of ECU’s IT optimization story is the impact it has had on their budget. Overall operations costs have been reduced tenfold and capital costs have been reduced eightfold. For a large public university, these savings are monumental. Lastly, San Antonio-based managed cloud provider Rackspace chose OpenStack because of the customization you can build on it, and because it optimizes the infrastructure you’re using. Daniel Sheppard, product manager of Rackspace Private Cloud Powered by Red Hat at Rackspace shared that people were constantly coming to them with legacy virtualization seeking the "DevOps utopia" they keep hearing about. With OpenStack, Rackspace can deploy infrastructure like it’s code, and the infrastructure is one that rapidly expands to meet customer requirements. "What we hear from customers is that OpenStack lowers the number of engineers involved," Sheppard said. When their customers have more nodes, they have more private clouds. As the number of nodes go up, they see cost savings. Sheppard asked customers what they saved, and the average number is around $600,000 in savings over a 60 node deployment annually. This result is compelling when customers ask how they can maximize their investment when using OpenStack. Rackspace is closely tracking the benefits customers have seen by using OpenStack, and expects these numbers to continue growing over the years to come. We’re rounding out the week at Red Hat Summit 2017 and there’s lots left to hear, see, and learn. Check back tomorrow for the last infrastructure updates of the conference.